Everyone wants a well-trained dog, one they can walk down the street with to the envy of all around, who is calm and friendly in the house, and does all you ask of him in an instant. But as any dog owner can tell you, that’s not easy! How do we go about transforming our dog into that perfectly behaved pooch? In our society today, it is considered common knowledge that any misbehavior by our dog comes from her trying to assert herself as “leader of the pack.” Our relationships with our dogs are looked at as power struggles. Any affection we show our dog or reward we give her is considered showing weakness, inviting her to take over. To maintain order, we are taught we must intimidate our dogs into submission, giving them painful corrections when they misbehave, and physically overpowering them until they comply with our wishes. This is the only way, we are told, that we can have a good relationship with man’s best friend. In reality, this view of canine behavior is outdated and has been proven inaccurate. The theory comes from 1947 research which was done on unrelated wolves in captivity who were put together to form a pack and observed while hunting. With no supporting evidence, the research was then extrapolated to apply to free wolf packs, which are typically made up of a breeding pair and their offspring, to those wolf packs at all times, not just while hunting, and to domesticated dogs’ interactions with each other and with humans. We now know that the conclusion of this study is not applicable to the interactions of wild wolves, let along domesticated dogs who have been selectively bred for thousands of years. For more explanation of how this theory has been disproven, see the references at the end of this post. This is good news for dog owners and lovers everywhere! Now we know that to have a happy and loving dog who is a joy to have in the family, we do not have to dominate or intimidate him. Rather, by using modern methods of conditioning, we can teach our dogs to follow the rules of our household. Using these methods not only do our dogs what we ask, they take joy in it! Think of Pavlov’s dogs. Every time a bell rang, they salivated. This was an automatic and predictable response; the dogs heard the bell, and they eagerly anticipated food. Now imagine what Pavlov could have accomplished if he had asked his dogs to earn the sound of the bell. Say, for example, that every time a dog laid down, the bell was rang, and the food promised by the bell followed. You can imagine what would happen: pretty soon he’d barely be able to walk with all the dogs lying around his feet, hoping for the sound of that bell! This is the principal on which clicker training works, but instead of a bell we use a “click.” By teaching the dog that the “click” means they get food, soon we have dogs who are excited and eager to figure out what we want them to do to earn the “click.” Once they have learned a cue, we stop using the “click,” but because that behavior has always been a fun thing they’ve wanted to do, they will continue to happily do it when asked. And wouldn’t you rather have a dog who gets excited when you ask him to do something rather than cringes? Recently, Debbie of fearfuldogs.com wrote a post I absolutely love, illustrating the common perception among Americans that training your dog has to mean forcing him into submission. She points out that the good behavior she gets from dogs comes from teaching them the “culture of human,” rather than demeaning or punishing them until they figure it out. Her story is a great example of how powerful positive training can be, so that even those who don’t necessarily put stock in it recognize the results. Modern research supports the power of positive training, as does the experience of trainers of all kinds of species, including chickens, cats, and dolphins (ever tried to give a dolphin a leash correction?). It is good for your dog, good for you, good for your family, good for your relationship, good for everyone! So give it a try, and discover how quickly and eagerly your dog can learn. Many people having children worry about how their dog will behave around their new baby. This is a fair concern – you don’t want any harm coming to your child! However, with some preparation, you can ensure that your dog will happily welcome your upcoming family member into the fold. Play sounds of a baby crying, screaming, laughing, etc. so dog gets used sounds that will soon be a common part of life. While the sounds are playing give your dog a stuffed chew, a favorite bone, play with him, to make the sound a positive thing. Be sure your dog has good knowledge of basic obedience cues such as sit, down, stay, and come. This will not only give you necessary control over your dog so she can safely be around your baby, it teaches her self-control so she can have the necessary control over herself! Consider taking a group class with your dog, so she gets used to listening to you in a hectic environment. You can also use a baby doll to set up new rules for your dog. For example, if your dog will be allowed on the couch in general, but not when the baby is on the couch with you, set up and teach your dog that rule with the doll before the baby comes. You’ll have the time and patience at this point to teach the new rules. Be sure to constantly reinforce them, so they are second nature by the time you substitute the baby for the doll. Get your dog (and you!) used to having his nails clipped regularly, as you will probably want them short around your child. Decide where your dog will sleep after the baby arrives. If it is different than where she is sleeping now, then make the transition before the baby comes. Be sure to run any new equipment you will use after the baby comes early, so your dog gets a chance to investigate it while it’s appropriate. Allow him to investigate it, but not mouth or jump on it. Some things to run include an electric swing, a mobile, and a bouncy chair. If your dog is currently the center of your world, spend some time not paying attention to your dog each day. Once the baby comes she won’t get your undivided attention, so get her used to it now. If your dog is always or sometimes not going to be allowed in the baby’s room, get him used to that fact now. Spend some time in there with the door shut and him outside while you assemble furniture, put away clothes, or do other chores you need to to get ready. In this way he will become acclimated to action occurring in the baby’s room while he’s not allowed in. Teach your dog good leash manners now. 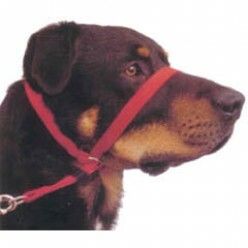 Consider using a head collar if your dog pulls. Once your dog has good loose-leash manners, take practice walks with your stroller. The basic rule for preparing your dog for your baby is to think of every change that will occur in your dog’s life after the baby is home, and slowly acclimate her to it before the baby arrives. If you do this, the baby’s arrival will be less of a shock, since there will not be as many changes when the baby comes home, and your dog will not associate any changes she doesn’t like with the baby. After the new baby is born, have the new dad take home an item that smells like your baby, such as a blanket he was wrapped in, and allow the dog to smell it. Dogs rely heavily on their sense of smell, so this will make the baby seem more familiar when she arrives. Allow the dog to smell the blanket, but not mouth it or play with it. When the family comes home from the hospital, have the new mom come into the house first and alone. Your dog won’t have seen her for several days, and so will be quite excited at her return! Let him get that excitement out on mom without baby there to worry about. When you are ready to introduce your dog to your baby, put your dog on a leash. Have everyone stay very calm, if you are worried it will make your dog worried. Bring in the baby and allow the dog to sniff and even lick him (don’t worry, your baby will be exposed to many more germs from visitors over the next few weeks than from your dog’s tongue). The dog should have know appropriate manners for someone holding a baby from your practice sessions with a doll, but if she exhibits any unacceptable behavior the person with the leash should simply take her a few steps away to calm down, and then bring her back to continue the greeting. Do not under any circumstances yell at or punish the dog during this first meeting. Your dog is making her first impression of the new baby, and you don’t want her to associate punishment with your child. After your dog has had a chance to greet the new baby, have a new toy or chew ready for him. This will help make your baby more positive to your dog, and keep him occupied while you settle in at home. Be sure your dog still gets lots of exercise every day. The number one way to reduce or solve problem behaviors is to exercise your dog! It is almost impossible to walk a dog too much; ideally your dog should be starting to slow down by the time you get home. Make a conscious effort to give your dog attention while your baby is in the room, so he does not learn that the baby’s presence always means he is ignored. If he draws this conclusion he will surely be resentful! Dogs can be a wonderful part of any child’s life, and with some simple preparation you can ensure that your dog will spend a long, happy life helping your child grow up! A dog owner is walking her dog through the park. Another person walks by and suddenly, her well-behaved angel starts growling and baring his teeth at the person, with his hackles up and his body tense. The embarrassed owner scolds her dog and corrects him with a jerk on the leash, and apologizes to the other person. They continue, giving each other a wide berth, and finish their walks. This type of thing has happened to most dog owners at least once, and usually, they have no idea why their dog is doing it. It is embarrassing, it makes a person feels like a bad owner, she’s afraid for the reputation her dog will get, and she just wants her dog to stop growling! The sentiment is common, and the desire to “correct” the dog until they stop is strong. A dog owner is walking her dog through the park. Another person approaches and her dog walks silently by her side. All of a sudden, as the other person is passing by, her dog lunges and latches his jaws onto the person’s arm. Shocked at the vicious attack with no warning, the owner apologizes profusely, and now may be stuck not only with doctors’ bills, but with having to surrender her “dangerous dog” to be euthanized. As embarrassing as it can be to have your dog growl, it has a purpose. Your dog is telling you that he is uncomfortable. He is communicating in a positive, safe way that he feels something is wrong, and giving you as his leader the chance to protect him from it by getting him away. It is far better that your dog give you this warning than that he keep his fear inside until it gets so big it comes out as a bite. When uncomfortable or scared, dogs have two main responses: fight or flight. If for any reason he feels that flight is unavailable to him; he is on a leash, he is in an enclosed space, running has not worked before; he will feel he has no choice but to resort to fight. Ninety-nine percent of the time, a dog is not growling because he is mean, he is growling because he is scared and he’s desperately hoping that if he tells whatever is scaring him to back off he won’t have to fight it off. However, if pushed, and if he feels he has no other choice, a dog will fight to get rid of something that is scaring him. Why is it we are embarrassed when our dog growls? Because we know that when a dog growls it is often a precursor to a bite. That precursor, though, is very important! Without the opportunity to give warning, to let you and anyone else know that something is scaring him, to growl, the dog has no steps left before biting. And then the attack is a complete shock. When dealing with a dog who growls, you do not want to teach your dog not to growl. You want to teach your dog to not feel like he needs to growl. If a dog feels like he needs to growl, but doesn’t due to training, all of the stress and feelings that lead up to a bite are still there, and the dog will still bite if pushed. This not only doesn’t help prevent dog bites, it makes them worse by giving you no warning they are coming. If, instead, you work with your dog and teach him to not feel the need to growl, by showing him that whatever he is scared of is not a threat and actually can be a source of good things, then the bite will not come. So what should you do if your dog does growl? Immediately turn around and walk away from whatever your dog is growling at, staying calm. Give him the space he needs to settle down, and then continue on. Once he is settled, the danger of imminent bite is gone. While you are leaving, see if you can take note of what your dog was growling at. You will want to know this for later training. Do NOT punish your dog for growling, verbally or physically. If you do this your dog will learn one of two things: that he shouldn’t growl and should go straight to biting, as discussed earlier, or that whatever he is growling at is even more scary than he thought. The way a dog’s brain works, he does not necessarily connect what he is feeling with what he is doing. Rather, he often connects what he is feeling with what he is seeing or sensing. So if a dog is staring at something that scares him and you correct him for growling, rather than thinking, “I growled, and so I felt pain. I should stop growling,” (a bad lesson anyway), he is likely to think, “I saw that thing, and I felt pain. That thing must be even scarier than I thought.” If your dog takes away the lesson that what he was growling at causes him pain, he is going to be even more nervous about it, and even more likely to bite next time he sees it. Now that you know what caused the growl, you know what your dog is afraid of, and you can work on teaching him he doesn’t need to feel afraid and growl. At this point you may want to contact a professional trainer to help you work with your dog. Even when based in fear, growling is a serious problem which can lead to serious aggression, and if not properly treated could lead to your dog being taken away and even put down. The sooner you start effectively working on it, the easier it will be to correct. If however, you feel that you can work with your dog yourself, below is one general method which can be applied to most cases of fear-based aggression. Invest in a clicker, a small hand-held device which, when depressed, makes a clicking sound. They are available for a dollar or two at most pet stores. You use it by teaching your dog that whenever he hears the sound of the click it means a treat is coming. To do this, click and then feed your dog a treat several times. Once he learns that the click means “treat coming,” the sound of the click signals that he did something right at the instant the click happened. Take your dog to be near whatever it is that scared him, but stay far enough away that he is comfortable. Wait for him to look at what scared him. As soon as he looks, click. Hopefully your dog will look back at you for a treat, and if he does, praise him and give it to him! If not, hold the treat in front of his nose to get his attention, and then give it to him. If he is unable to take the treat that is a sign of a high level of stress, so move farther away from the scary object. This lesson is three-fold. First, it teaches your dog that when he looks at that thing he thinks is scary, something good happens. It can’t be that scary if every time he sees it he gets a treat! Second, it teaches him to check back in with you every time he sees that scary thing. If your dog’s natural instinct is to look at you, he is not getting stressed or upset, he is looking to you to tell him it’s OK and trusting you to make sure it is so. Third, it builds up the number of times your dog sees the scary thing without losing control. If your dog is in the habit of snarling or growling every time he sees something, then it becomes an automatic reaction, even if in that particular instance it wouldn’t be scary on its own. Building up repetitions where your dog has a reaction other than his automatic fearful one helps the fearful reaction to stop being automatic. Practice this clicking for looks, and if your dog picks up on it you may start clicking for looking back at you after glancing at the thing he finds scary, rather than looking at the thing itself. Once your dog gets the idea of the game, start moving closer to the scary object slowly. You want your dog to stay far enough away that at any stage he does not feel so intimidated he loses control or starts growling. If this happens just move back farther and try again. Depending on how long your dog has been scared of the trigger it may take a long time to get very close at all to it without a reaction, but that is OK. Remember that every physical step closer is a big mental step for your dog, and celebrate it as such! If at any point you feel that this training is not working, or that you cannot handle your dog’s growling alone, contact a professional trainer immediately. A professional trainer who uses positive methods can help you refine your skills on working with your dog using this or many other tactics, depending on the specific situation, and the cost of a trainer will be far less than the doctor, vet, or lawyer bills you could be stuck with if the problem isn’t gotten under control. Remember: Growling is good! No dog is more dangerous than one who does not give warning before a bite. Work with your dog using positive methods to eliminate the cause of growling, rather than the growling itself, to ensure the safety of your dog, yourself, and everyone around you.